Set off for Jekyll Island on the Georgia coast. Jekyll Island is a barrier island, around one mile wide, which shields the mainland from the Atlantic Ocean and storms. The land is low lying and covered with forests. The seashore is a fine sandy beach. 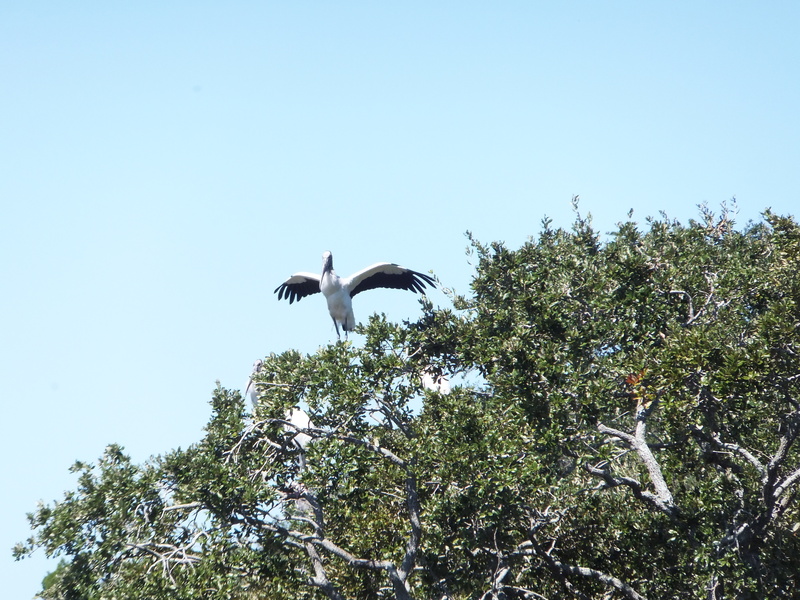 Between the barrier islands, which extend along the coastline of the southern states, and the mainland are broad salt marshes which are home to a wide variety of wildlife. After a 6-hour drive we arrived at the Jekyll Island Club Hotel. Early in the 20th century Jekyll Island was the winter home of famous American millionaires who built their ‘cottages’ here. 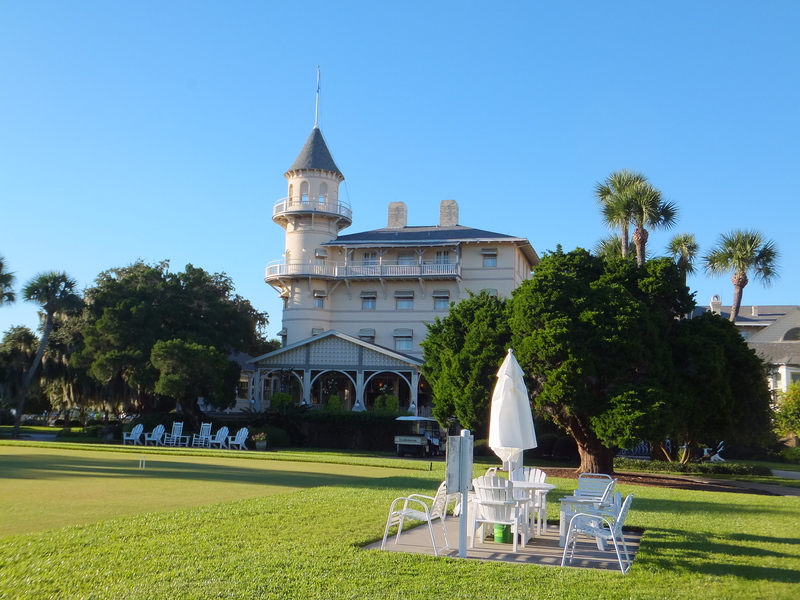 The Jekyll Island Club was the retreat for those who did not have their own cottages. When Richard last visited here in 1976, the Club was abandoned and derelict. Now it has been restored to its former glory as a luxury hotel. We had booked ourselves in for a couple of nights so we could pretend to be like two millionaires of old. We got up at 6.30, had a quick breakfast in the Cub’s café and drove off to St Mary’s to catch the ferry to the next door island, called Cumberland Island. The crossing through the salt marshes took around 45 minutes. 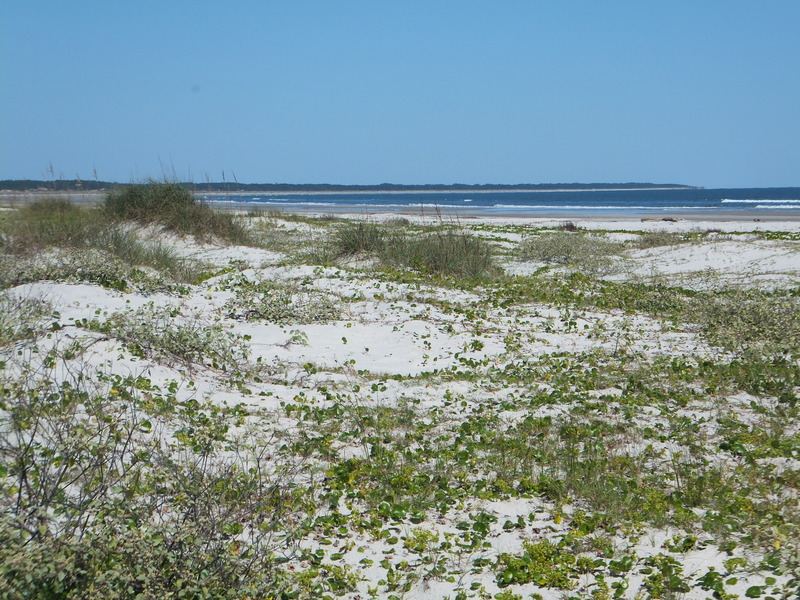 Cumberland Island is sparsely populated, and is mostly a nature reserve. Surprisingly perhaps, there are a number of wild horses roaming around. There are also the ruins of ‘Dungeness’, a splendid mansion built by Thomas Carnegie, the brother of the magnate Andrew Carnegie. We spent a lot of time looking out over the salt marshes at the wildlife: herons, egrets, pelicans, etc. Then we walked along the white sandy beaches and afterwards into the forest before returning to take the ferry back to the mainline, and then south again and over the causeway to the hotel for dinner in the Grand Dining Room, which was as good in terms of ambience, service and cooking as we have enjoyed anywhere. Setting off a little later today, at around 8.30, we drove around the southern perimeter of the Okefenokee Swamp so as to enter it via the western entrance, and drove up to the Stephen C Foster State Park (he was the songwriter who wrote ‘Way down upon the Swannee River’, and it’s named after him because the Suwannee river rises near there). 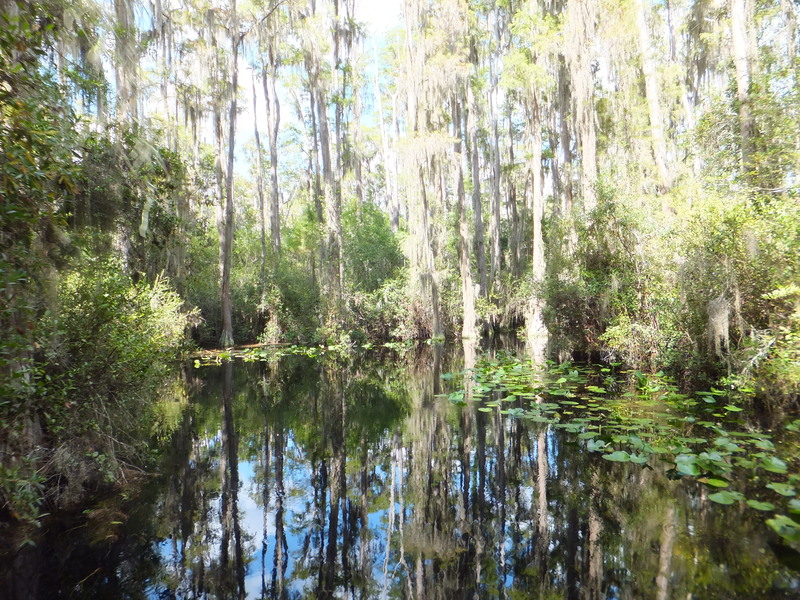 We signed up for the afternoon boat trip which took us out into the swamp, which is made up of creeks overhung with tall cypress trees. Sadly most of the big old trees were logged out a century or so ago. Our young ranger guide was a very good guide and quite humorous. He declared he was an avid fan of Dr Who. Funny the places you turn up talking about these things. He also had a taste for PG tips tea. Afterwards we set off for Savanna where we checked into our very trendy hotel close to the waterfront, and enjoyed a particularly excellent Italian meal in the hotel’s restaurant. It was very hot today, around 90°F, and as Richard had done quite a lot of driving recently, we decided not to press on to Charleston, but to stay and explore old Savanna, so we walked along the waterfront, which is well signed with historical information, and then through the shady squares with some fine old houses. We visited one, Davenport House, a very fine 19th century house with a splendid staircase. After stopping to refresh ourselves with a delicious ice cream in an old-fashioned ice cream parlour, Leopold’s (founded 1919) we set off back to South Carolina to Trish and Chris. After some intensive days of tourism it was pleason Lake Hartant to relax in Trish and Chris’s spacious and comfortable lakeside house. 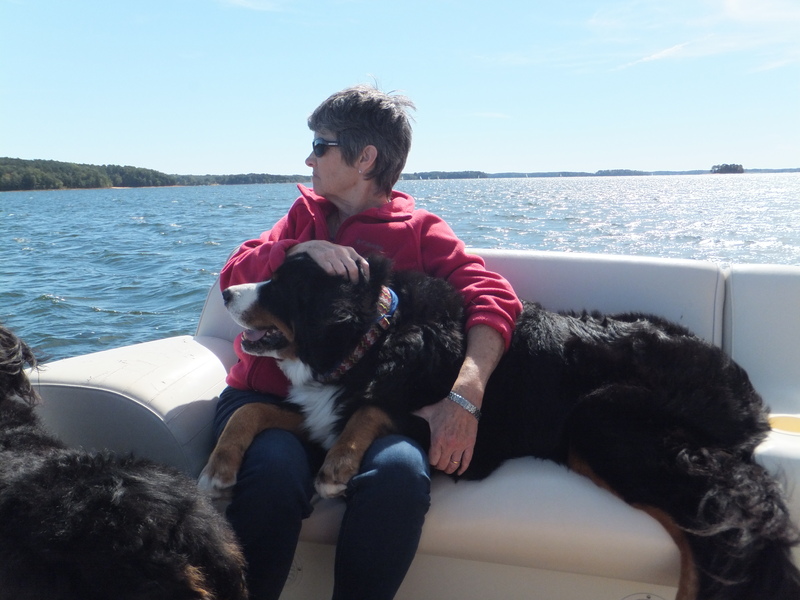 In the morning Trish was out with one of her dogs – she is involved with an organization which uses dogs for therapy, visiting old people’s homes, and also visiting schools, where children find it easier to read to dogs than to adults. In the afternoon we drove to the huge dam on the other side of the lake, which is most impressive. As well as being a reservoir, Lake Hartwell is used for leisure activities, and there are a number of docks with sailing boats, motor boats and even several houseboats. 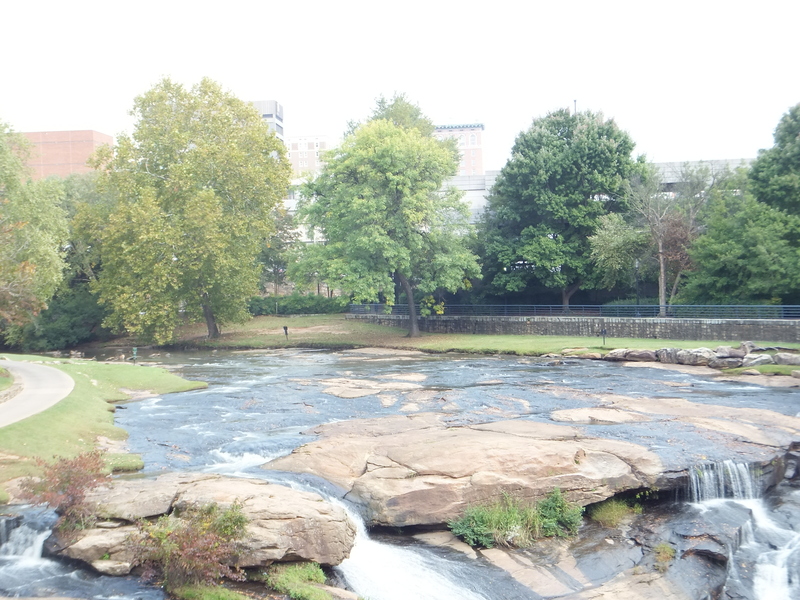 Trish and Chris showed us their local city, Greenville, which is very fine. The old, run-down city centre has been tidied up, and an interesting new curved bridge has been built over the river and waterfalls. 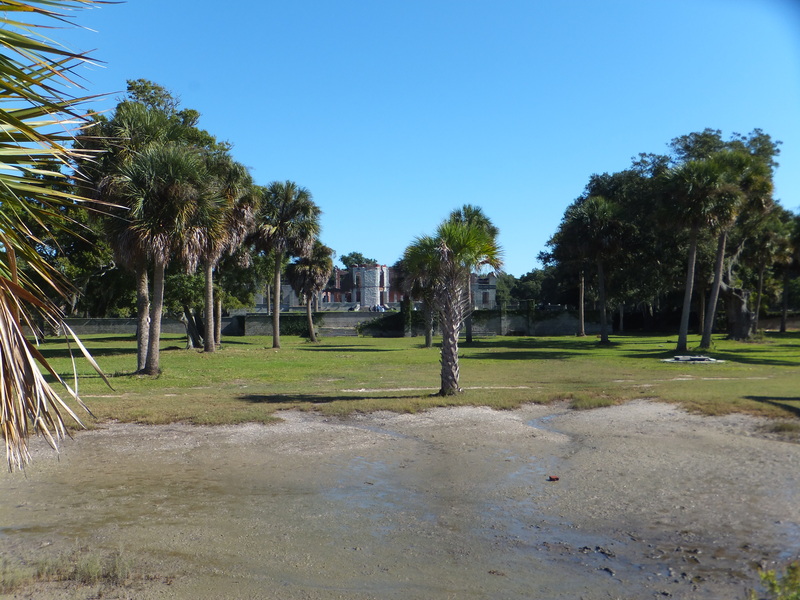 Beside the river there is now an attractive park with walking and cycling trails. Greenville has several arts venues including theatres and concert halls. We shopped at Mast’s Store (smaller but more interesting than LL Bean in Maine). We had lunch in a city centre restaurant serving typical southern food before visiting the city museum in the afternoon to learn about the fascinating history of the ‘backcountry’ of upper South Carolina. By the time we left Greenville it was a pleasant, warm early evening, and the centre was filling up with visitors to the ‘Fall Food Festival’, at which local restaurants and food producers have stalls, and there is street music and entertainment. 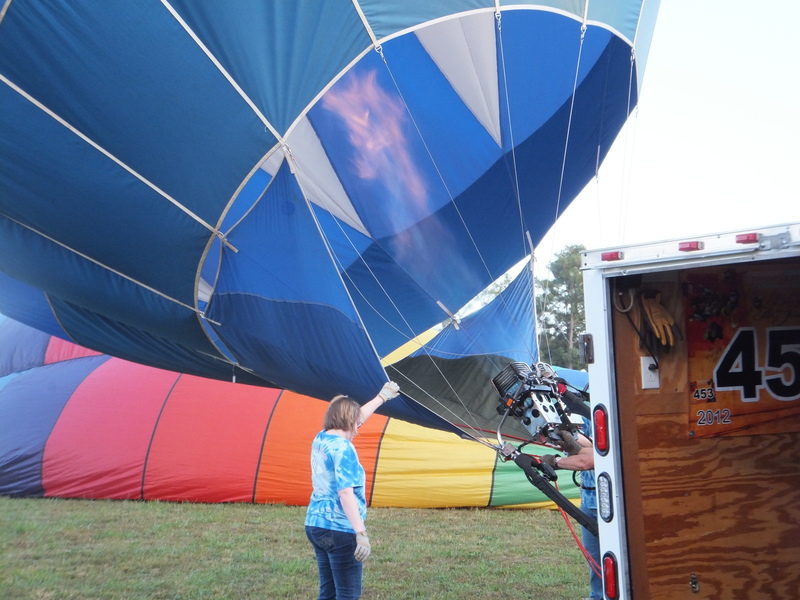 We went into Anderson, the nearest city to Townville, to see the annual air balloon festival. Because of the wind nothing started until the late afternoon but then we had a ringside seat to see them all get airborne. There were about 20, all brightly coloured, so it was a great spectacle. We did some more shopping, mainly some clothes for Richard. Today Chris also took us to see a new house built by Habitat for Humanity, a charity for which he works, building and doing electrics, which provides affordable homes for people with low incomes. We were really impressed by the high standard of finish and appliances. It poured with rain today, so we got up gently, had pancakes, bacon and maple syrup for breakfast, and eventually decided to go for a drive in the country. We headed further into the backcountry which was very interesting and picturesque. When in the foothills of the mountains we got out of the car and walked up a path to some very fine waterfalls (Twin Falls). We’ve had a great time staying with Trish and Chris, enjoying their hospitality, the friendly dogs, slightly more aloof cats, and Chris’s store of amusing anecdotes. We left Trish and Chris mid-morning for Atlanta and Robert (aka Bob) Kirk and his wife, Joyce. As it was only about 2 hours away, we stopped off to visit the huge Georgia Mall, though we didn’t buy anything. Robert and Joyce have an interesting house in Roswell, a suburb of Atlanta. The house is mainly wooden, and stands on a sloping site surrounded by trees. Like all the other people we visited, they have bird feeders, where we saw our first good view of bluebirds. 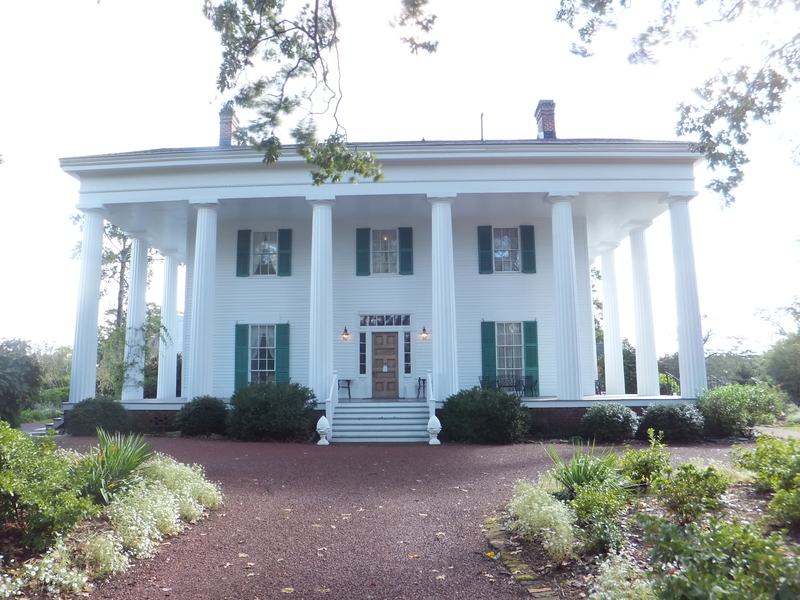 It was rather wet today so we drove into Roswell to look at old ante-bellum mansions. 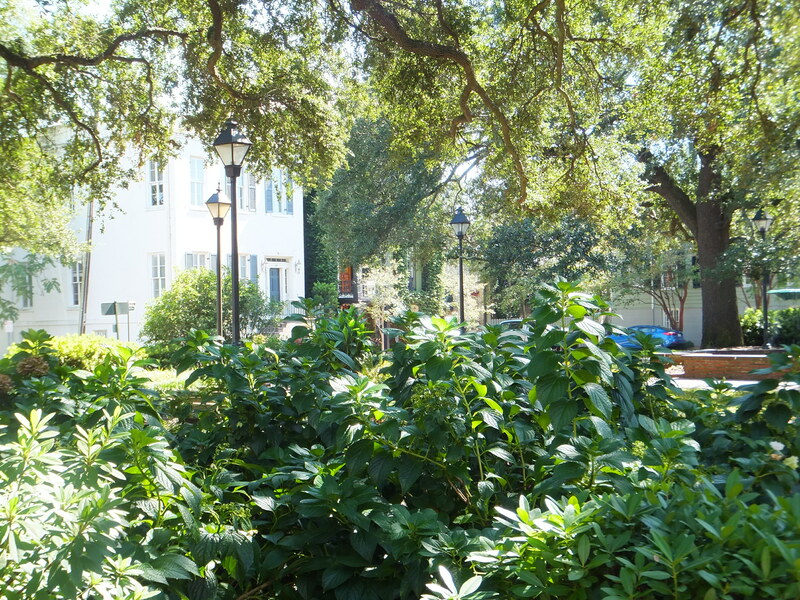 We visited the interior of one, which still had much original furniture, and the rather nice gardens of another, which have been partly restored to their original form and planting. Joyce cooked another tasty meal which we enjoyed with a bottle of wine. We sat around and chatted and then went for a walk in the nearby park before lunch. We set off for the airport in the afternoon. Atlanta rush-hour traffic is as bad as London’s, and getting into the car rental return ‘defied gravity’, involving an apparently never-ending spiral. Sometimes Americans do make life difficult for out-of-towners. Once we arrived at the airport, everything went smoothly, though the plane was slightly delayed. All in all we had had an excellent month, managing to go through every state on the eastern seaboard, meeting friends and family, and seeing fascinating places, as well as hiking, birding and shopping.